If you’re in the market for the ultimate in high quality contemporary mirrors, you’ll have heard of Piaggi Art & Living. They’re a long established European Designer and manufacturer of luxury, decorative interior design products, and their mirrors are simply beautiful. At Contemporary Heaven we have a large selection of amazing Piaggi Wall Mirrors on offer at great prices. We’re going to highlight a few below, but there are lots more so don’t forget to search our site! More like a work of art on your wall than a mirror, the offset ‘eclipse’ design features coloured art glass mosaic on a walnut finished, beech frame. The mirror incorporates a hangar on the back of the frame and the mirror sits flush on the wall, adding a touch of glamour to any room. Whichever of these stunners you choose, you’ll be the envy of your friends. They’re a real talking point too. Circular, with an art glass mosaic frame reminiscent of the numbers on a roulette wheel, the glass reflects the light, and the different colours in the range mean one will be perfect for your room whatever colour your décor. This beautiful asymmetric piece can be hung both landscape and portrait. Whichever way you choose, it will immediately become a centrepiece and a great conversation starter. The mosaic coloured glass is reminiscent of the kaleidoscopes that always fascinated us as children, but there’s nothing childish about this abstract and contemporary design that will steal the show in any setting. 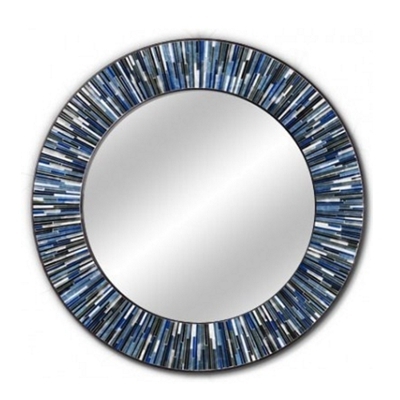 The Kaleidoscope mirror is available in three frame finishes… dark ash, light ash, and white.